CULVER CITY, CALIF. (April 7, 2014) – The chemistry continues on June 3 when Sony Pictures Home Entertainment releases one of the most critically acclaimed and award-winning shows of all time, BREAKING BAD: THE COMPLETE SERIES, available on Blu-ray™ with newly created packaging, and, for the first time ever, as a complete series set on DVD. Just in time for Father’s Day and graduation gift giving, the explosive saga of high school chemistry teacher-turned-meth kingpin Walter White is available in its entirety, including all 62 uncut, uncensored episodes. 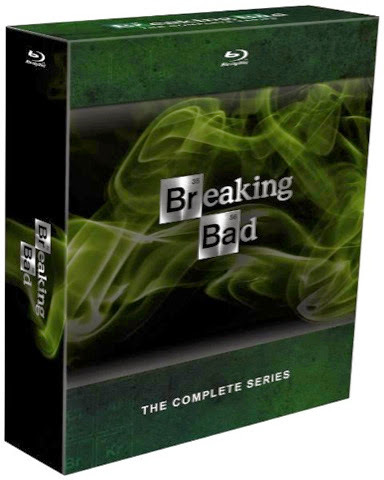 The 16-disc Blu-ray set features more than 55 hours of bonus content, including the Blu-ray exclusive “No Half Measures: Creating the Final Season of Breaking Bad” documentary,chronicling the making of the final season, from filming the first table read to the very last day on set and everything in between. The 21-disc DVD set features more than 50 hours of bonus content. The incredible saga of high school chemistry teacher-turned-meth kingpin Walter White is here in its entirety: all 62 uncut, uncensored episodes! Emmy® winner Bryan Cranston portrays Walter White, a family man who turns to crime after a lung cancer diagnosis unravels his bland but simple life. Recruiting former student and small-time drug dealer Jesse Pinkman (Emmy® winner Aaron Paul) to be his partner in crime, Walt rises to the top of the meth trade, leaving a trail of bodies in his wake. But he can’t keep his dogged DEA agent brother-in-law Hank Schrader (Dean Norris) off his trail forever. Will Walt get away with it all, or die trying? Re-live every moment of this groundbreaking original series with riveting performances by Emmy® winner Anna Gunn, Giancarlo Esposito, Jonathan Banks, Bob Odenkirk, Betsy Brandt, RJ Mitte and more. Breaking Bad was executive produced by Vince Gilligan, Mark Johnson and Michelle MacLaren. The complete box set is loaded with special features. · “No Half Measures: Creating the Final Season of Breaking Bad,” an exclusive two-hour documentary that chronicles the filming of the final eight episodes. BREAKING BAD: THE COMPLETE SERIES is not rated.